The Explorer Jacket perfectly embodies C.P. Company philosophy. Here’s an authentic icon, renewed with added performance, thanks to a continuous research work. An arrival point, a new beginning. The myth of the explorer is not dead in the modern world. Undoubtedly, the boundaries have been pushed more far: from Marco Polo to Neil Armstrong, nowadays the real frontier is beyond Earth, in space. But the fascination for exploration remains the same. Every explorer in the last two thousand years has been granted admission in the collective consiousness also because of his clothing: clothes define the explorer, from Lewis and Clark to Jacques Cousteau or Edmund Hillary. 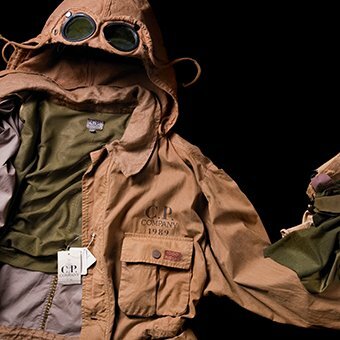 Still, when Massimo Osti designed the first Explorer Jacket in 1988, he wasn’t inspired from the great explorers of the past. Rather, from the explorer who still has to come. The idea came from his archive, as often. 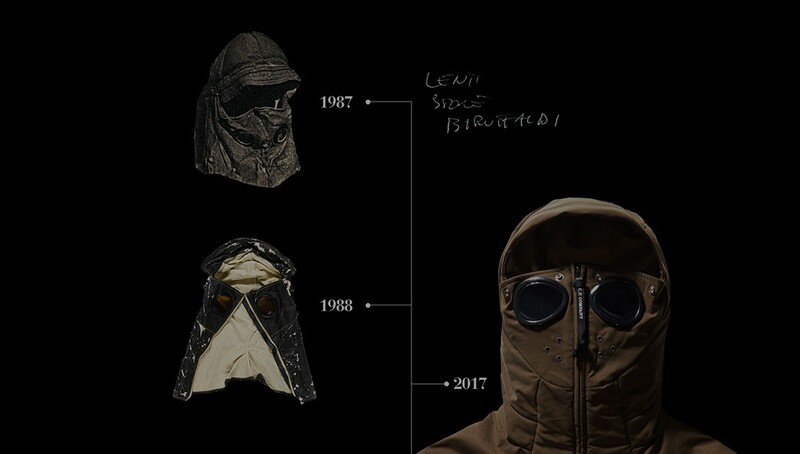 More precisely, it was an iconic item from a distant country, a protective hood worn by the Japanese Civil Defence, similar to a balaclava with a zip on the front and two lenses sewn into the fabric at eye level. 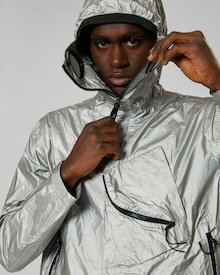 Osti grew excited about the idea of making a jacket with lenses sewn into the fabric. The problem of preserving the fabric’s integrity around the perimeter of the glass lenses was resolved thanks to a frame specifically created by the Italian company Baruffaldi, a world leader in the sports optics field. 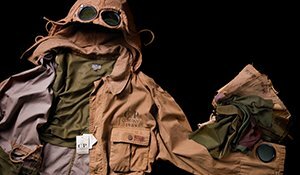 The first prototype was a four-pocket field jacket, Saharian-style, which features lenses sewn into an extended collar. It was like the hood which originally inspired Massimo had been attached to a field jacket. The Explorer Jacket was produced in very limited quantities in Spring/Summer 1988 in Mais cotton. Mais was born from the collaboration between Osti and ITS Artea, a leading company in the field of fabric finishes which partnered him in his experiments. ITS Artea had woven for him a 100% cotton fabric with a white warp and a husk green (from here comes the name) weft. This way when dyed the green weave would remain darker than the white, creating the illusion of visual depth, of a thick and full-bodied material. The resulting fabric had great evocative strenght, exactly as the Explorer Jacket from Spring 1988. 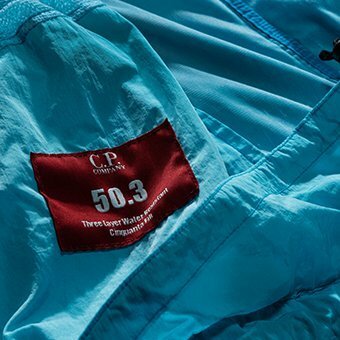 The Jacket was featured in C.P. Company Magazine, worn by young Bolognese artist Andrea Renzini, who had just begun his career. Osti recognised people of his own kind. Experimenters. Explorers, if you prefer. 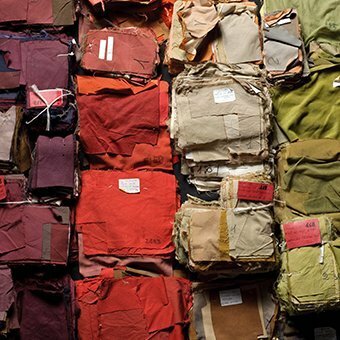 It’s no surprise that his most famous creations are jackets which evokes adventure. The Explorer Jacket, in a way, embodies Osti’s work ethics: to push boundaries, to look further, towards the unexpected. C.P. Company Spring/Summer 2017collection reinvents this iconic garment, thanks to designers Paul Harvey and Alessandro Pungetti. The iconic detail of the lens sewn into the oversize collar is featured on two short jackets, produced using two different cutting-edge C.P. 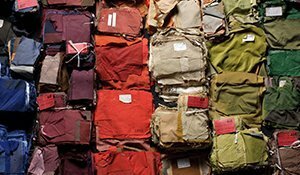 Compay fabric. The first fabric is Piuma 50, an ultralight version of C.P. Company’s iconic 50 Fili creaed by . Piuma 50 maintains exactly the same composition and construction technique as 50 fili but uses the latest fabric technologies to weigh only 80grms/sqm, 50% of the weight of the original fabric. 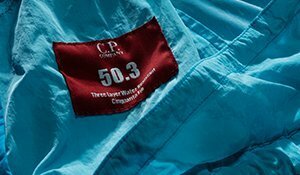 Thanks to the new Component Dyeing technique, the fabric can be used to produce a fully-waterproof jacket with a softness and wearability unparalleled elsewhere on the market. The second fabric is Pro-Tek, a high-performance stretch polyester jersey with water repellent coating, developed specifically to combine the weight and comfort of a sweatshirt, but with the protective functions of an outer-layer.The result is a lightweight, extremely flexible and performing fabric. Two new versions of the iconic Explorer Jacket, 29 years from his creation. They respect the original Osti design, updating it by using true performance fabrics. New fabrics for new silhouettes, built on consistents points of reference. Explorer Jacket perfectly embodies C.P. Company philosophy. Here’s an authentic icon, renewed with added performance, thanks to a continuous research work. An arrival point, a new beginning.